This article was created in partnership with Fiverr. Thank you for supporting the partners who make SitePoint possible. In this article, we are going to teach SitePoint readers how to select the right gig on Fiverr for marketing copy. As a worldwide verified freelancing platform, Fiverr is a 100% safe and productive site where you can buy and sell services. 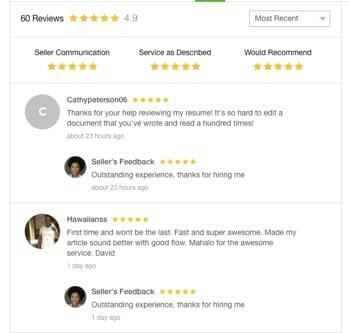 Boasting one of the fastest customer service departments available today, Fiverr's team immediately responds to questions and inquiries for a seamless customer usability experience. We are going to go over how to select the right gig every time when shopping on Fiverr. 1. Be realistic about your expectations regarding the price you need to pay for a required writing job. Quality work costs more, even at Fiverr. Although it's still more affordable than any other freelancing marketplace, you're not going to get published on Forbes, or publish a high-quality e-book with custom illustrations, if you don't invest several hundred dollars. Think of Fiverr as your go-to marketplace where you can always find the most affordable deals on writing services and more. Projects range from short blog post editing that will cost you only a few bucks, to top quality e-book writing services that will cost you several hundred dollars. 2. Know how to clearly communicate. A good and bad point of Fiverr is that it's a global marketplace with every nationality selling and buying services. That means you need to be able to clearly articulate what it is that you want, in basic English, without the complexities. If you can't clearly explain what it is that you need, do not try and outsource the project. That's a sign that you need to go back to the drawing board and reevaluate what it is that you need, first and foremost. When approaching a freelancer, you need to have an adept understanding of the task at hand, and the details required to make it happen. It's ok to be a pain – the writers expect it. Now is the time to be safe, rather than sorry, and get all the information out in the open. It's up to the writer if they want to take on the task or not. Now that you're ready to address your marketing copy, first understand that there are a variety of gigs out there related to content marketing. You can work on a press release, e-mail copy, newsletter, blog, product description, website page, and the list goes on. For the sake of this piece, we're going to look at the 3 most important marketing copy gigs for our business: blogging, emailing, and editing & proofreading. 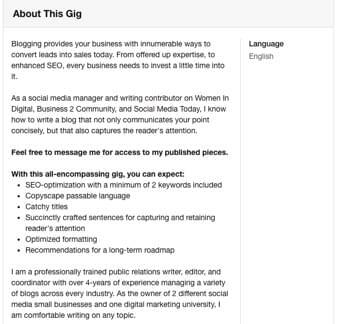 Blog writing gigs are applicable for B2C, B2B, and personal posts, providing brands with an easy way to communicate a message, announcement, or feature to their followers. You want to find a writer that matches your personal style. 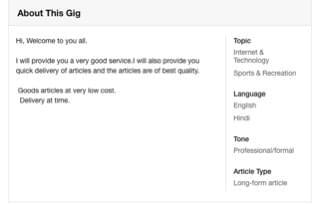 Within basic gigs, you can reasonably expect a Fiverr writer to provide 100-300 word blog posts, with titles and references. Your Blog URL: Firstly, send the writer your blog URL. 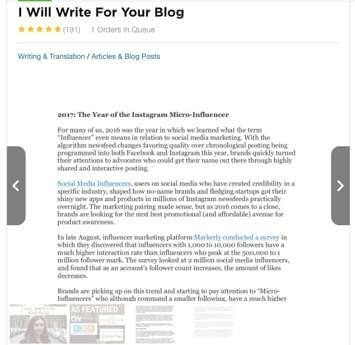 They need to be able to familiarize themselves with your blog tone. Your blog might be informal with a little humor, or it could be incredibly serious and fact-based. Your ghostwriter will know how to take on your tone, but they need the right information first to make it happen. If you don't have an existing blog, do your best to find at least 1-2 links to other blogs that have the tone you want. Your blog writer is not a mind-reader, and needs some kind of starting point in understanding your overall goal. The more examples you can provide them, the better. Your Topic: Although blog writers can come up with completely original topics just based on your industry, if you do have a topic in mind, now is the time to communicate it to them (and not after the blog has been written). Let's say you own a social media management company. There is plenty to write on, but where do you want them to begin? Are you looking for more conversions regarding your SEO service? Tell the blog writer you want a blog on the benefits of SEO with a call-to-action at the end pushing the reader to sign up for your SEO services. Although some of this might seem self-explanatory, be sure to articulate exactly what topic you want if that's your end goal. If not, you can let the blog writer do their thing. Any Secret Specifications: When we find reliable Fiverr providers, it can be easy to assume they know how to do everything. Ghostwriters can select topics, research them, and write amazing marketing copy for your business. However, they can’t know that your company is only six months old and doesn’t actually provide SEO services (but will in two months). These secret specifications need to be communicated from the onset. It's not fair to surprise them after the entire blog has been crafted. Email copy gigs on Fiverr will help you draft one or multiple emails for luring customers and patrons to your website. Within the basic gigs, providers on Fiverr will vet your platform and draft up one or two emails that you can send to your subscriber list. If you explore gig add-ons, email writers can write a series of emails, with release dates, so you continue to string on your leads. A variety of editors are able to provide rewrites, proofing for grammar, syntax, spelling, and capitalization, as well as feedback on the copy, through editing and proofreading gigs. Within the basic gigs, editors will proofread up to 1k or 2k words on your behalf, tracking their changes in a Word document. You can choose to accept or reject the changes, as well as request that a tracked changes and accepted changes document is provided at the end of the order. Now that we've explored the types of marketing copy gigs available to you on Fiverr, we're going to look at 5 steps for selecting the right marketing copy gig. There are many writers and editors available to you through the site, so where do you begin? How do you weed out the faulty providers? Here are our recommendations. 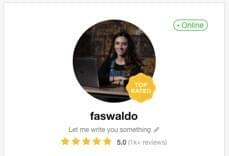 As a review-based platform, you want to use Fiverr's publicly stated reviews to your advantage. If a gig only has 2 reviews, and one of them is not 5 stars, chances are you're not going to gamble. But if you see a gig with 300 reviews and a 5 star average, you know you're working with a serious provider. In the above example, we can see that the seller has 60 reviews with a 4.9 star average to date. You can also see the most recent reviews and honest opinions of this editor. Take your time to vet these types of reviews before you select your provider. Read what other people have to say. Maybe the editor does an excellent job, but tends to under-deliver their word count, failing to edit past the 700 word mark. Or maybe the writer is lying about their native English proficiency. Many non-English speaking writers try to claim they are proficient in English. If you see any comments warning about this, definitely run the other way. It's the little things like this that are made public to you on Fiverr – take the time to read them! 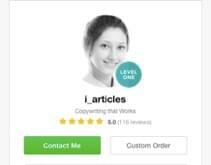 Fiverr enables writers and editors to upload PDF files of their work for buyers to see. You don't have to guess or wonder about their talent. Plus, as an art form, writing can be incredibly personal, and maybe you just don't like how someone writes. Besides asking them for examples in the message thread, go right into the gig and look at their posted work. You can find the portfolio examples right in the open gig by clicking the left and right arrows to filter through the pieces. In this case, the seller has provided a PDF of a blog article they posted, as well as a slide with the newspaper publications they have been featured in. It's easy to tell if a writer is serious or not based on the amount of work they have put into the gig. In this case, the writer made a gig photo, newspaper slide, and posted 2 PDF examples of their writing for you to see. It means they have nothing to hide. After spending time reading the posted PDF pieces, you can also request even more samples from a private message thread with the writer. To do that, simply look on the right hand side of the open gig, and click "Contact Me." Serious sellers will be more than happy to provide you with additional samples of their work. Read what they send so you can already expect the type of blog at the end of the order. If you spend enough time during this selection step, you'll be guaranteed a blog that you love. The gig description is where sellers can outshine one another by telling you what they promise to deliver with the gig. If you see a tiny, incomplete gig description that promises nothing, chances are, you aren't going to be happy with the results. However, if you find a gig description that is comprehensive and bulleted out, now you can vet what you want. Maybe you want a writer with a political background, or one that has extensive business experience. You can find your answers in good gig descriptions, and select a writer that you feel has the best insight into your business. In this case, the writer has natural social media marketing and business management experience, as disclosed at the end. They have also clearly stated in a bulleted list what they will guarantee with your finished blog post. You don't have to agree with it or like it, but at least you know. Shop around until you like what you see. Level 1: This is a seller that is just starting out. This means they have not been on the platform for too long, have completed the bare minimum orders, and only have 1 or 2 open gigs. This doesn't necessarily mean they are a bad talent; it just means they haven’t been around for long. 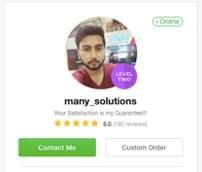 Level 2: This is a more serious seller with a high completion rate, multiple open gigs, a fair amount of completed orders, and a 4.5 or higher average review rate. Top Rated: This is a seller that is one of the Top Rated talents in their respective category. They have multiple open gigs, stellar reviews, many completed orders, and excellent customer service. PRO: PRO Sellers are their own category, as the handpicked top 1% talent of the platform by Fiverr. These are experts in their fields, with a track record to prove it. Regarded as the best service providers within the site, PRO Sellers do come with a more expensive price tag as a result of their standing. 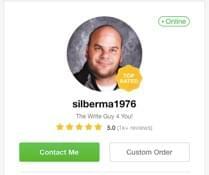 When looking for the verification, a ribbon will appear over the seller's picture indicating their ranking. This ribbon can only be Level 1, Level 2, or Top Rated. A PRO ribbon sits to the bottom of their picture on its own. 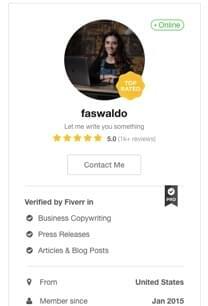 Lastly, the final part of finding the right copywriter includes using the nice filters already provided by Fiverr in the search feed. You can turn a toggle on just for PRO, look through the different categories you might be missing, specify a delivery time, add in your price range, look for sellers that are presently online, add in your writing tone, select the type of seller status you want, seller location, and lastly, the language. We recommend looking for a Level 2 seller or above, selecting the English functionality, and even looking at seller location as you want a writer from a native English speaking country. Pro: They might go above and beyond for you, for little money, as they are trying to grow their gig. Pro: They will take on any kind of crazy project, even if you aren't communicating it correctly. Pro: It doesn't cost a lot. Con: It might be low quality work when they are done. Con: The time and effort on your side might not be worth the cheap price tag. Pro: They are going to deliver a higher quality piece to you. Pro: They are going to do so with fewer questions and back-and-forth than cheap writers. Pro: They are serious about their online business and are more reliable. Con: In some cases, the more expensive price tag might not be worth the product. Con: They might take their own direction with the piece and create something you don't want. Bottom Line: Once you familiarize yourself with the search and filter features on Fiverr, you can find a marketing copy gig that is perfect for you. With writing, it's something more personal and preferential than programming or engineering. That's why it's up to you to take the time to shop. Look for reviews, pricing, gig descriptions, portfolios, seller ratings, English proficiency, honesty, and responsiveness when selecting your ghostwriter. Try it all! Test out an expensive and cheap copywriter and compare the results. When used correctly, Fiverr is tremendously valuable for marketing copywriting.